Hi there! I went to a team day on the weekend & had to take along some basic tools. 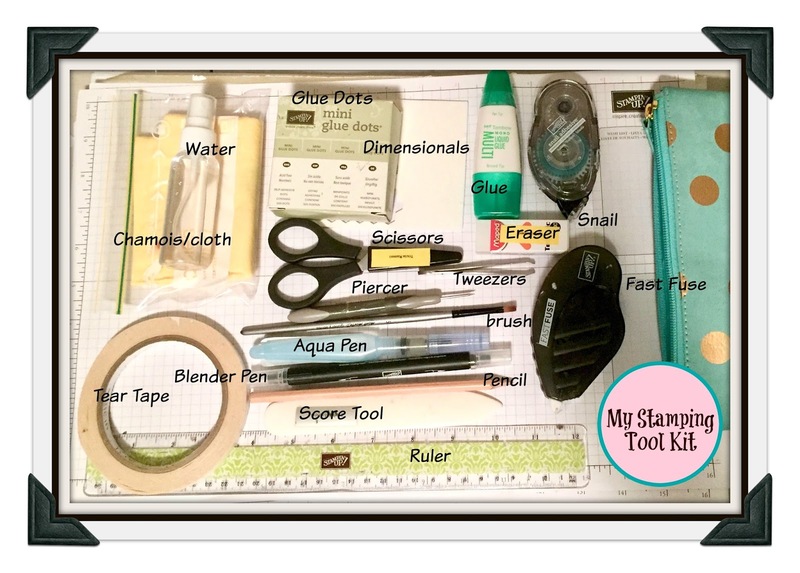 This got me thinking... what do I think are basic must-haves in a Stampin' Up! tool kit? I am thinking new demonstrators or even customers coming along to class would benefit from seeing the contents I suggest are important when stamping. Now, these are just MY must-haves. It's important to note that everyone is different & may prefer different items. As you can see I have a lot of items here in my kit. They all fit (just) into a pencil case & most likely a large stamp case also. I prefer to take my own chamois/water mist in case the person doesn't have a Stampin' Scrub. It also saves on baby wipes. The cloth washes clean & is better for the environment. I have lots of different adhesive here, however, my adhesive of choice is Tombow Glue. I use it more than I use say the tape or the Fast Fuse, so these could be removed if you are stuck for space. I have added a fine paint brush to my kit recently. There are 2 reasons for this. 1) I can use it if I am heat embossing to flick off any stray powder & 2) I have my water mist so I can fill the lid & use the brush for water colouring. So, there you have it, my stamping tool kit. What do you keep in yours? What would you add or remove? There is one item I have accidently left out of my kit - can you guess what it is? It is something I use quite a bit too. I have added it to the shopping panel below as I do believe every tool kit needs this! You can purchase a lot of these items from Stampin' Up! so I have added the links below in case you would like to create your own Stamping Tool Kit.